You are here: Home > Media > Blog > Apprenticeships have a starring role in the government’s technical education reforms. But are they delivering? Apprenticeships have a starring role in the government’s technical education reforms. But are they delivering? Rarely a headline-grabber in the broadsheets (or indeed, the tabloids), yesterday’s speech on technical education by the Education Secretary offered a welcome respite from the mind-numbing livestream of Brexit-related updates. 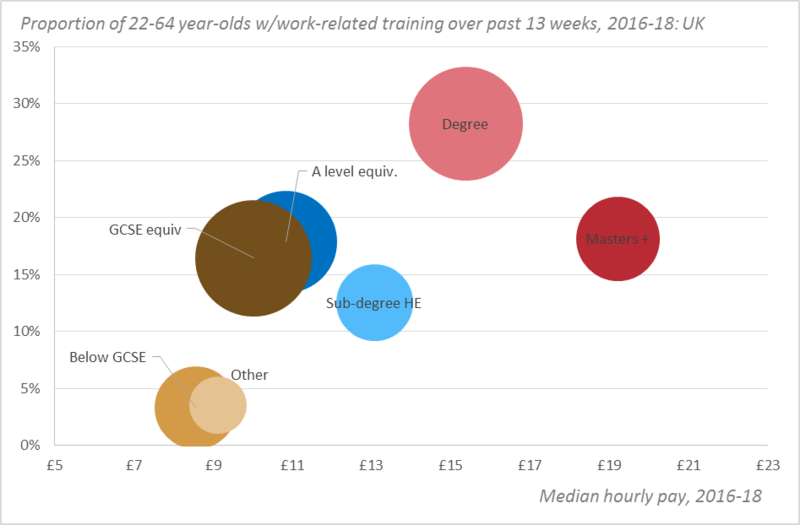 The central premise of Damian Hinds’ speech – that the UK’s technical education system should offer young people clear routes into specialist, well-paid careers – has particular relevance this week, as the final figures for apprenticeship starts during 2017/18 were published just minutes after his talk concluded. The ability of the apprenticeships system to underpin the Secretary’s vision for technical education remains unclear but important, even if it doesn’t make the front pages. How do things look so far? First, the year-on-year fall in starts has been confirmed: the total number of starts during 2017/18 was 24% lower than 2016/17, and 26% lower than 2015/16, which was the final full year of the pre-levy apprenticeship system. In all, there were 133,000 fewer people starting an apprenticeship in 2017/18 than there were during 2015/16. And yet the headline figure is just one part of the story: if you want to understand what is really happening in the system, you need to look beneath the lid. 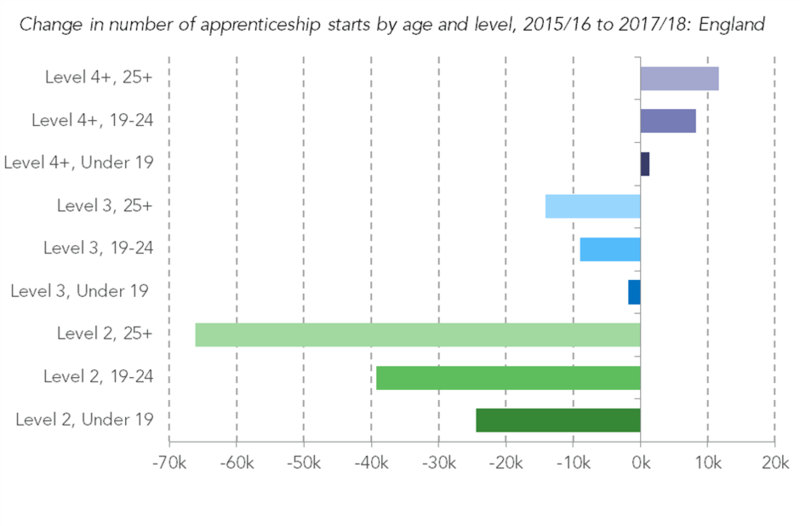 The fall in starts has not been equally distributed across apprenticeship levels and ages: as a share of all starts, those going to older apprentices at Level 2 fell most. Those going to older apprentices at Level 4+ grew most. This equates to 66,000 fewer apprentices aged 25+ at Level 2, and 12,000 more at Levels 4+. On the one hand, there is little reason to bemoan a drop in programmes that have often in the past offered little actual training and development, and have in some cases served as a substitute for low-paid labour. On the other hand, the Education Secretary suggested that apprenticeships and T levels should serve as a ladder into ‘specialist’ and ‘well-paid’ work. Worryingly, the numbers of under 19’s– who presumably would benefit most from such a ladder – starting an apprenticeship has taken a 19% fall. The area with the largest growth, both in absolute terms and as a share of all starts, is at Level 4 and higher. There are indeed acute areas of labour market demand for qualifications at this level, and as Damian Hinds’s speech highlighted, higher-level technical programmes provide an excellent pathway into well-paid work for those who opt not to follow the traditional A-level to university route. 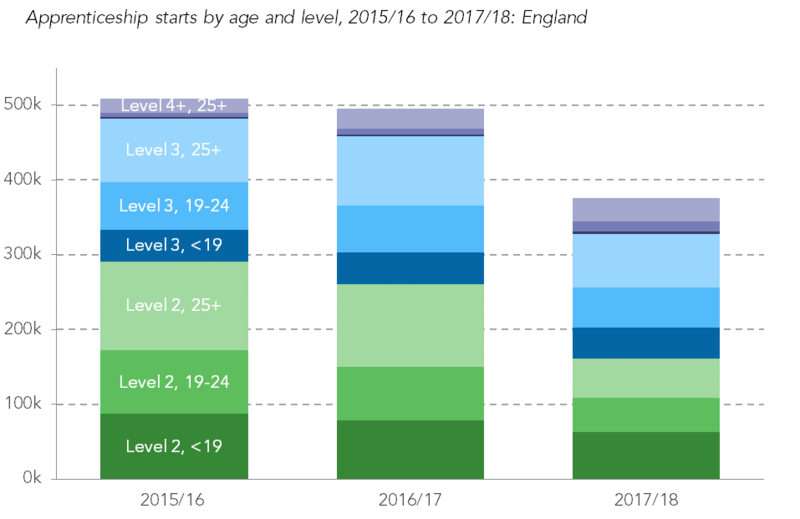 And yet, the available data doesn’t allows us to analyse whom the growing number of starts at Levels 4+ are going to: are they being used as a ladder for people to move up and into skilled employment, or are they simply ‘rebadging’ work-related training and employer-sponsored courses for the already highly-qualified? The latter prospect is worrying: work-related training has long been the preserve of the already highly-skilled and highly-paid, so an apprenticeships system benefiting those at the top would of course reinforce pre-existing inequality. Investing in human capital is increasingly important, particularly since our progress in bringing people up from lower-levels of attainment has stalled over recent years. However, lifting the lid and understanding where precisely that investment goes allows us to determine whether it will serve as a ladder for people wanting to move into skilled, well-paid employment or as a reward for the ‘already-haves.’ The Education Secretary has set out a vision for a technical system that achieves the former; we’ll be monitoring whether the apprenticeships system works with, or against, that aim. This article was originally published in the Times Education Supplement.